The result of almost two years of research, this report surveys free expression policies among state and local arts agencies, including procedures for anticipating and handling controversy. Its purpose is to provide the arts community, as well as others interested in censorship or cultural policy, with solid research that will enable grant-making agencies to take a principled stand on artistic freedom without alienating their audiences or losing their funding. The report includes candid interviews with agency officials regarding funding disputes, political accountability, and most important, ways of reaching out to communities and opening up dialogue about challenging or provocative art. 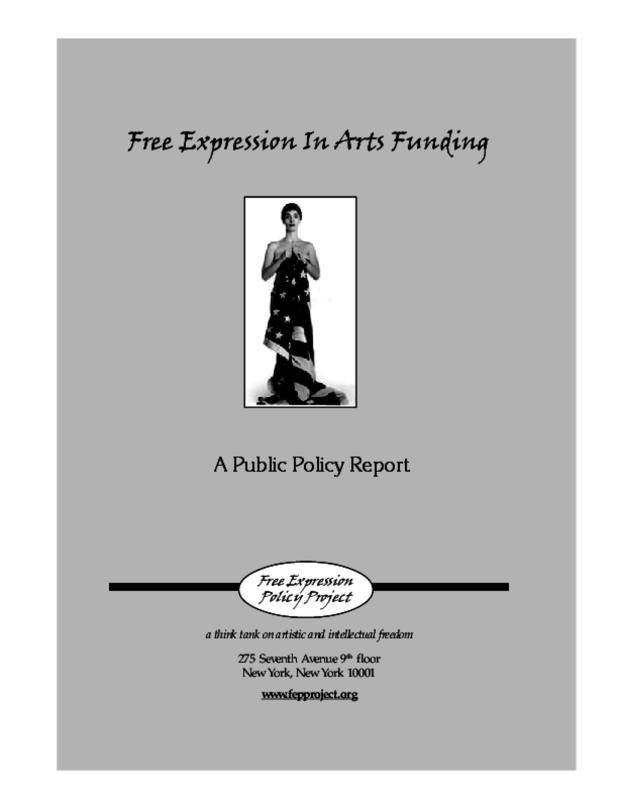 The report also contains extensive background on the "funding wars" of the 1990s, illustrations, and two appendices summarizing free expression statements and policies among all state arts agencies and a random sample of local agencies. As the Executive Summary points out, despite America's recent history of attacks on controversial art, artistic freedom in the context of public funding remains a critical issue. The ability to make challenging art that can explore all facets of the human condition, including unpleasant ones, is essential to a vibrant culture and a healthy democracy. Neither private philanthropy nor the mass media conglomerates that dominate commercial entertainment can be counted upon to support the give-and-take of diverse viewpoints, reflected through literature, theater, music, film, and other visual art, or to provide visibility for the multi-layered, varied, and inventive cultures of America.